In this world, all things must pass. Your favorite TV shows end, budget airlines randomly cease operations and strand passengers, and even unlimited breadsticks run out when Olive Garden closes for the night. And that sad list now also includes Nacho Fries... again. We know that Nacho Fries are about to make another departure from the Taco Bell menu, but it's unclear when precisely that'll be. Taco Bell told Thrillist that the fries will continue to be on menus nationwide "through early April." So, in short, don't take their presence for granted. If you see them, get an order (or 10) while you can. 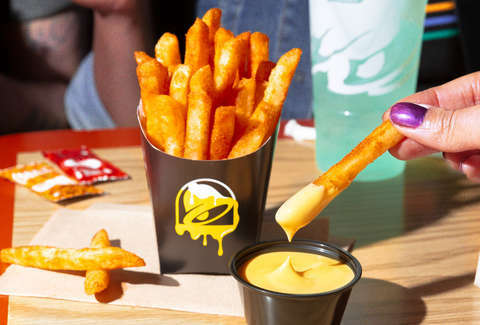 If for some reason you need a reminder of what we're even talking about here, Nacho Fries are seasoned French fries served with warm nacho cheese dipping sauce. You can get them a la carte for $1.29, Supreme for $2.49, or Bell Grande for $3.49. And as of recently, you can also order them as Steak Rattlesnake Fries, complete with steak, jalapeño sauce, and jalapeños.